Pope Francis thinks the Internet is a "gift from God." Pope Francis made remarks about the Internet and the technology age that were behind the times, but not woefully so. Pope Francis is definitely cultivating a “cool pope” persona. He was named person of the year by the Advocate, he refuses to wear celebratory ermine-lined capes (whatever, let the dude make his statement), and he gives liberal-minded interviews. But there’s still that whole, you know, pope thing. He’s the head of a huge conservative church and opposes things like gay adoption accordingly. It seems like a pretty major step to have a pope call the Internet “truly good” in its first 50 years—it took nearly 360 years for Galileo to be pardoned for saying that the Earth revolves around the sun. But it’s not exactly a shout-out to DARPA, IARPA, or the rest of the sci/tech community that made the Web possible. Pope Francis says that he likes to think of communication as “neighborlines,” and a means for recognizing each of our human-ness. He says, “It is not enough to be passersby on the digital highways, simply ‘connected’; connections need to grow into true encounters.” He goes on to use the phrase “digital highway” a bunch more times. And then he says the part that’s probably most productive in terms of endorsing the Internet: “Let us boldly become citizens of the digital world. 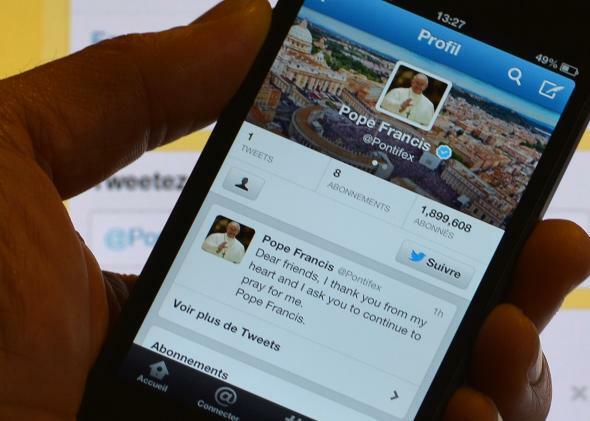 The Church needs to be concerned for, and present in, the world of communication.” Now it’s true that pretty much everyone who is able has already “boldly” taken the leap into the digital world—even the papacy has had an official Twitter presence since December 2012. But no one should be surprised that the church is behind on this issue. Reconciling church doctrine with modern realities is a necessity for the Vatican, and it seems like the cool pope is on it.